Hi Ducks! Get ready for one of the biggest on-campus events of the year! This year's Spring Carnival is brought to you by Connect The Ducks and it is going to be so much fun! 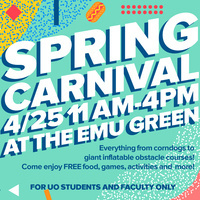 We are going to have everything from corndogs to inflatable games, so make sure to find your way out to the EMU Green on April 25th from 11 a.m. to 4 p.m. to enjoy the festivities-- you won't want to miss it!